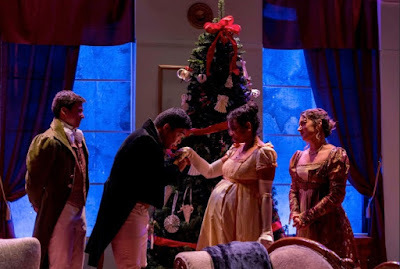 Carol's Theatre Reviews ~ It's Fun To Go Out: “Miss Bennet: Christmas at Pemberley” A Giving Gift From New Village Arts. “Miss Bennet: Christmas at Pemberley” A Giving Gift From New Village Arts. There are holiday shows and then there are Holiday shows. “Miss Bennet: Christmas at Pemberley ” is most likely one not seen on the holiday circuit, at least not in San Diego, or for that matter in Carlsbad, that is until now. Set just two years after Jane Austen’s "Pride and Prejudice” ends this charming little confection by Lauren Gunderson and Margot Melcon currently on stage at New Village Arts Theatre in Carlsbad through Dec.23rd is a win- win for San Diego audiences. As the sequel to Jane Austen’s novel of manners it takes on ‘the subject of ‘Mary’, Jane’s bookworm and barely seen nor talked about shy sister. Played with charm, grace and awkwardness by Nadia Guevara (Associate Artistic Director) as Mary, Gunderson and Melcon’s little gem is just what the doctor ordered for this holiday season and we tip our hats to Artistic Director Kristianne Kurner for bringing us this San Diego premiere. 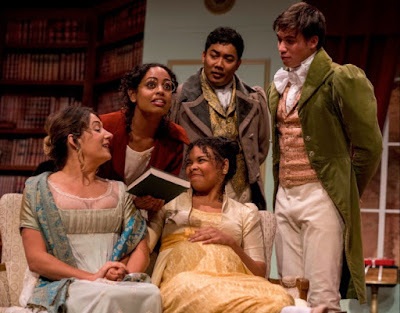 Steered with an all knowing eye by Kurner (her 99th) the production brings out the marvelous interactions and play of four siblings all assembled at Elizabeth (a charming Jessi Little) and Darcy’s (solid Timothy L. Cabal) estate in Pemberley for the Christmas celebrations. 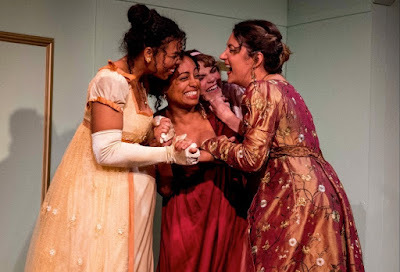 All this done with a contemporary feminist slant, as the siblings in Austen's play take center stage with grace and purpose. It made my heart sing. It is here as well that the sight of a Christmas tree (inside the home) was a new phenomenon, as it takes on a character of its own. It was fun to watch the expressions as each character had a similar reaction to the presence of the tree. The sisters begin to arrive one by one and two by two: Mary is the first to arrive. Pregnant Jane (charming Amara Young) and her husband Bingley (“The Boy Who Danced on Air” Sittotchai Chaiyahatt, was a close friend to Darcy) follow. 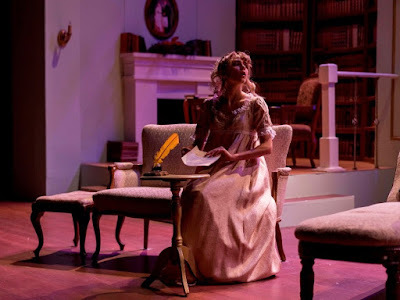 Younger sister, the high- spirited, free wheeling and flirtatious, to camouflage her unhappiness, Lydia Wickham (McKenna Foote), whose marriage to Charles Wickham is the bane of her existence, arrives in a flurry. Thrown into the mix, the equally nerdy, book-wormish, shy, studious and lacking in social skills Lord Arthur de Bourgh (Carter Piggee), DeBourgh a friend of Darcy’s arrives in the throw of things. He just inherited a large estate and has no idea what to do with it. He feels a bit out of place at the Darcy home, that is until he meets up Mary in the library room where they talk of travel and books with ease. After all the guests arrive and the niceties, hugs all around and Christmas tree talks go back and fourth, the beginning of an attraction is in the air and thickens between Mary and Arthur, who don’t know what to do with it. 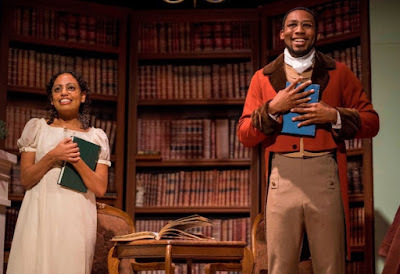 Playwrights Gunderson and Melcon with Kurner guiding, these two socially inept, lonely, yes lonely, young people are drawn together first by their love of books, knowledge and the sharing of truth and then voila, love. Love for those in the know is elusive so when Anne de Bourgh (Michelle Marie Trester “Romeo, Romeo and Juliet) bursts into the Darcy home demanding Arthur return at once with her to the estate owned by her late mother and willed to Arthur, well, things become a bit hectic. She demands Arthur was promised in marriage to her by her domineering late mother and will not concede otherwise. Ms. Trester is a force with which to be reckoned as she dominates poor Arthur to almost submission to her demands. Lydia’s restlessness becomes a minor problem as well for Mary and Arthur when Lydia intercepts a letter from each to the other. It’s quite predictable; you’ll figure it out, they did, but for the while, it was a nail bitter watching the trio go back and forth, in and out of romance. This is what makes the world go round and this production will do that to you. McKenna Foote is filled with that restless energy as she skillfully creates mayhem for the would be lovers. As mentioned earlier, Ms. Guevara (“Secret Garden”, “Cloud Tectonics”) is an absolute gem as Mary. With specs needing a little nudge and adjustment on her nose (both she and Piggee wear specs in the production and both are lefties) and delicate features, she seems to float on air whenever she moves. Her insistence on being accepted for who she is not what anyone else thinks she should be, is my kind of woman. Elisa Benzoni designed the smart looking period costumes; sound designer Melanie Chen Cole coordinated the sound and Nina Gilbert the piano pieces played by Mary to perfection, and hats off to dialect coach Gerilyn Brault. The set, designed by Kristianne features a smartly designed sitting room with a large picture window looking to the outside with a map of the world. Bookshelves surround a small library room where Arthur and Mary share their love of books and conversation. The entire frame of the stage is a large heart made of books fastened together with a rod with a map of the world as their oyster. If I told you that all’s well that ends well’ that ends well believe me. Not only does it end well, all parts in between bodes well for all concerned. This is two thumbs up must see.